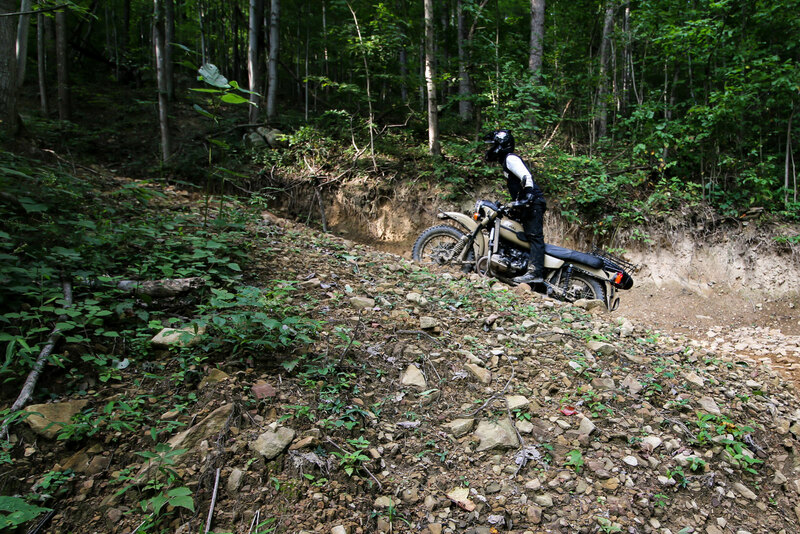 The proving grounds were the rugged terrain of the Hatfield McCoy trails in West Virginia. 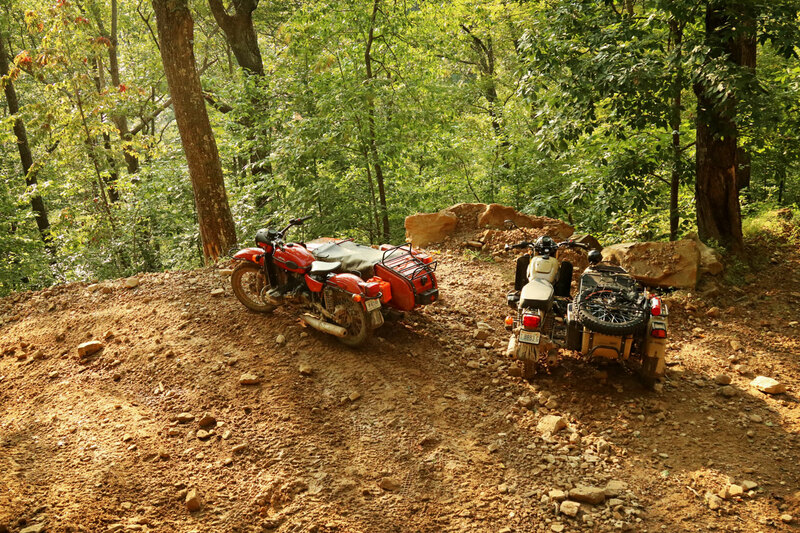 A perfect place for a challenging duel to compare the capabilities of our one-wheel drive and two-wheel drive sidecar motorcycles. 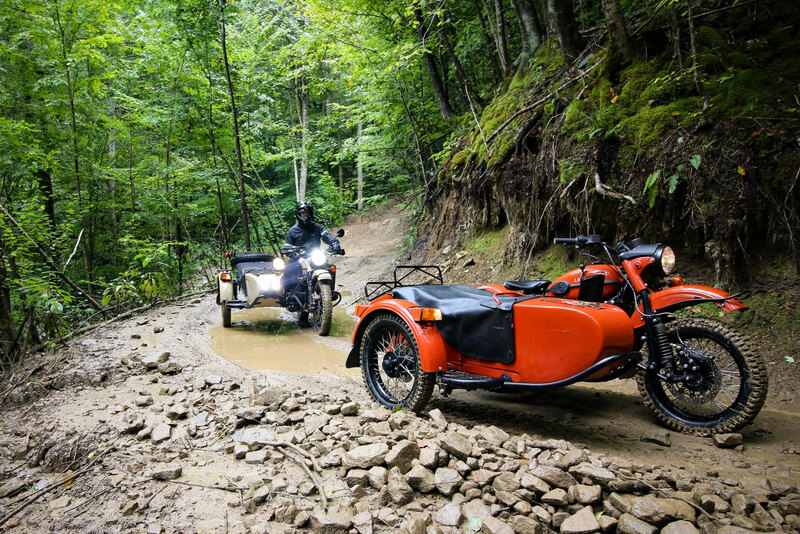 Read on to see how well the Ural sidecars traversed the rough and muddy mountains; I’m bettin’ you’ll be surprised. Both Urals are 2016 models. Casey piloted the 1WD cT and I (Corey) drew the presumably more capable 2WD Gear Up Sahara. 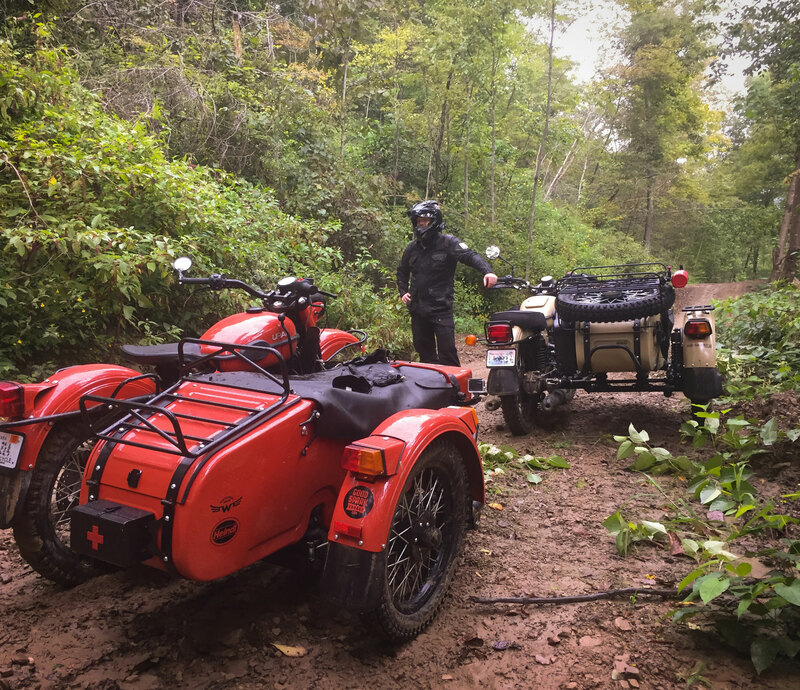 Being twins with similar weight and sidecar experience, this was a pretty accurate side-by-side comparison out on the Hatfield McCoy trails. Both steeds are powered by fuel-injected 750cc boxer-twin engines with tractor-like torque. I’ll tell you skeptics now that the 41-horse powerplants each propelled over 900 pounds of bike and human with ease. (Still skeptical? Watch the accompanying video). 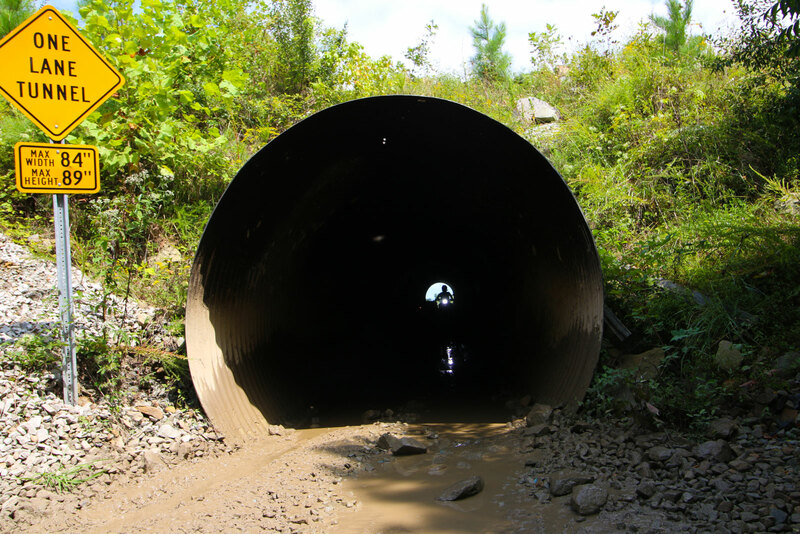 The Hatfield McCoy trails span over 600 miles (and counting) with many levels of difficulty. Some routes really show their teeth and look like they wanna break your bones, while others are more welcoming and docile. Massive ruts that plunged deeper than our available ground clearance meant some trails were off limits to us, but there was no shortage of gnarly miles we could opt for. 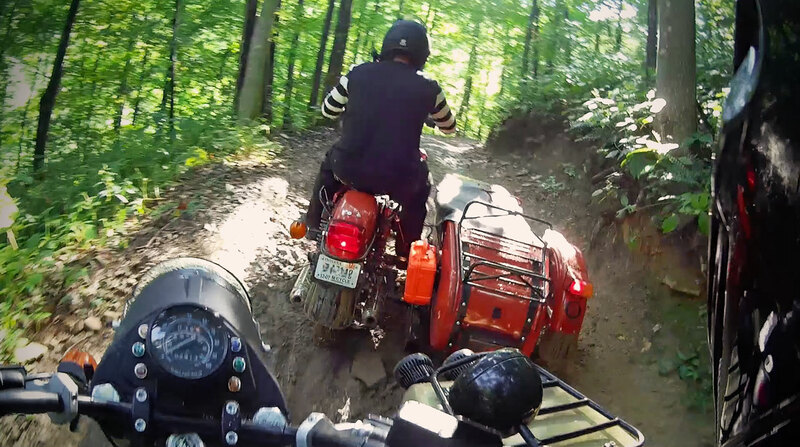 Casey, left, on the Ural cT and Corey on the Gear Up Sahara at the Devil Anse ATV Resort. We stayed on the bottom floor of this cabin. It can sleep up to 6 people. Our basecamp was the Devil Anse ATV Resort, where we stayed in a newly built cabin called “Sherriff Sid’s Jailhouse.” It was named after one of the area’s colorful family-feuders. Police Chief Sid Hatfield had gold-capped teeth and a hankerin’ for fightin’ which fueled his role in the 1920 Matewan Massacre. We rode right up to the brick building that still bears bullet holes from the shootout between the coal miners Sid sided with and a group of “thug” detectives hired by the coal corporations. Sid would survive this scenario, but meet his demise a year later when vengeful detectives shot him on the steps of a county courthouse. I mention this man’s past to help paint a picture of this area, where scarred landscapes, tired towns, and harsh history are hidden in these Appalachian hills. 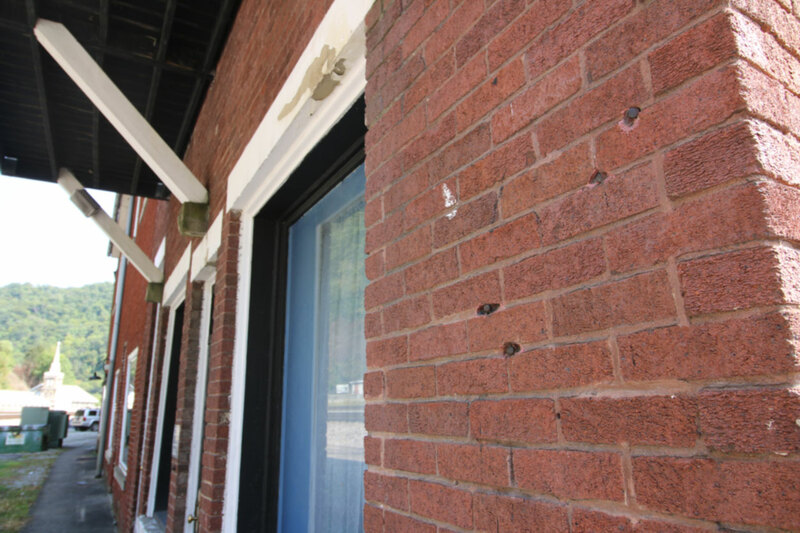 Bullet holes at the site of the 1920 Matewan Massacre. 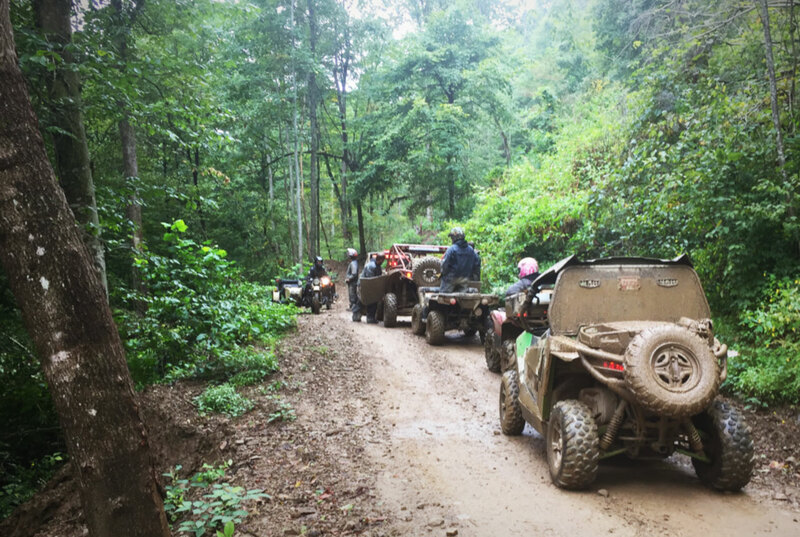 For our first experience on the Hatfield McCoy trails, we set out on the Devil Anse trail system which is accessible via the grounds we were staying on (very handy). A steady rain fell on this day, creating mud baths in the low spots and slippery rocks on the hillsides. 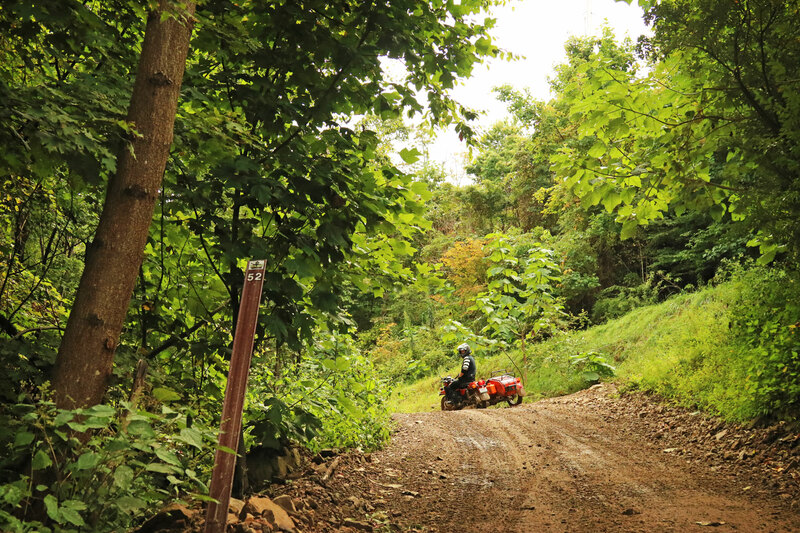 With the Gear Up’s two-wheel drive engaged and a fresh set of Heidenau K37 dual sport tires, it climbed the hills with confidence and minimal wheel spin. The one-wheel drive cT, being lighter, threw more of a roost while the rear wheel spun more easily. Casey simply leaned back to weight the rear Heidenau K67 knobby (a trials type of tire), which was key in reaching the top of each steep grade we encountered. It’s worth noting: the stock tires on the Urals would not have been successful in these muddy, wet conditions. This isn’t a chop on the standard-issue rubber, just a testament to the unmerciful environment. It was a little muddy. The Gear Up carried more weight than the cT, including a full 10L jerrycan, extra racks, all the 2WD linkage, and a spare wheel and tire. It effortlessly ascended the slimy trails even when the tight switchbacks wouldn’t allow a run at ’em. This wasn’t the steepest hill we encountered and many had loose rocks on the way up. Riding on the King Coal Highway. The 1WD cT went everywhere its more utilitarian counterpart went. Of course, the knobbies helped. Before the trip, we traded the stock Heidenau K28 street tires for the offroad-friendly K67s. I’ll put it like this: the Gear Up‘s ability to gain traction is a bonus, but don’t count out the 1WD in the rough stuff. If you know some basic throttle management while scanning the trail ahead, the cT is a very capable dual sport machine. In other words, the 1WD can take you farther than you’d think. A view from Corey’s Sena 10c helmet camera and communication device. The 1WD cT on the left and the 2WD Gear Up Sahara on the right. During the second day of riding on the Buffalo Mountain trail, we dropped in on the coal town of Delbarton. It’s the kind of tiny community that hosts gospel sings in the town square, where free burgers, slaw and baked beans are offered to sidecar motorcyclists covered in mud. We said thanks, but decided to log some more miles before dark. Before we rode away, one fella gave us a lengthy report on the state of coal mining in the area, along with his disdain/praise for U.S. presidents, Obama and Trump. A very hot topic among the locals. 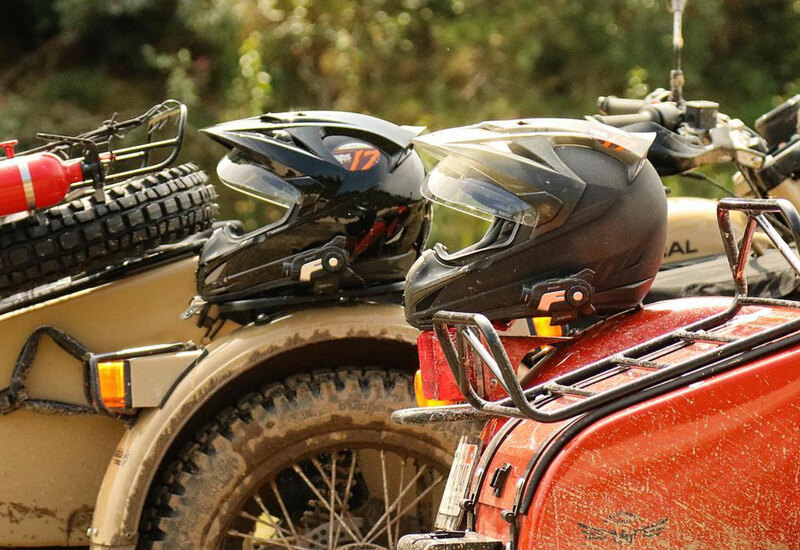 We mounted the Sena 10c devices on our Icon Variant helmets. Recently, I read the following comment on one of our social media channels: “What’s with riding sidecars when you don’t have passengers? ?” My answer: Dear, Puzzled Guy. I hope this injustice doesn’t have your stomach in knots. As since the day sidecars were invented, they are not limited to human cargo. 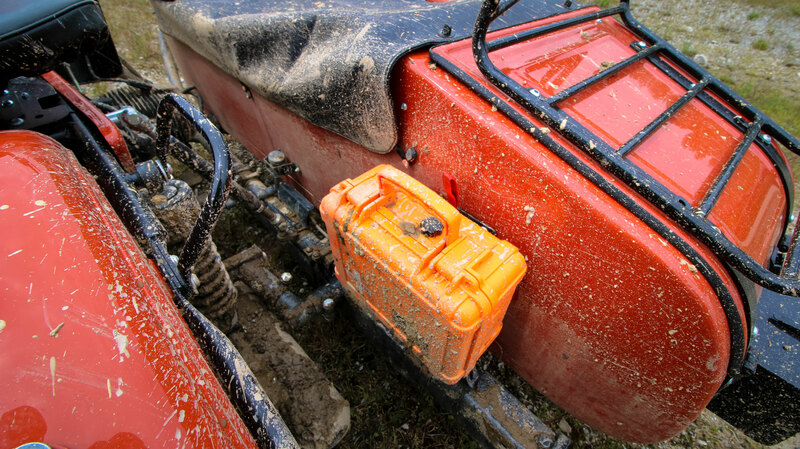 The ample storage allows us to easily carry rain gear, tools, camera equipment, food, drinks, first aid kits, and other stuff we don’t feel forced to jettison before a motorcycle trip into remote and unfamiliar territory. That’s what’s with it. The Outer Limit Supply Day Tripper Series first aid kit with quick-release mount. Safety first! We mounted the Outer Limit Supply Day Tripper Series first aid kit to the cT (see pic above), which holds a ton of dressings, tools, and medications (even a tourniquet and 24″ moldable splint). The thing is tough, too, made of high-impact ABS that’s watertight and crush proof. The quick-release mount allows you to grab it and go for instances when every second matters. Waiting for a train in Williamson, WV, one of the bigger mining towns in the area. 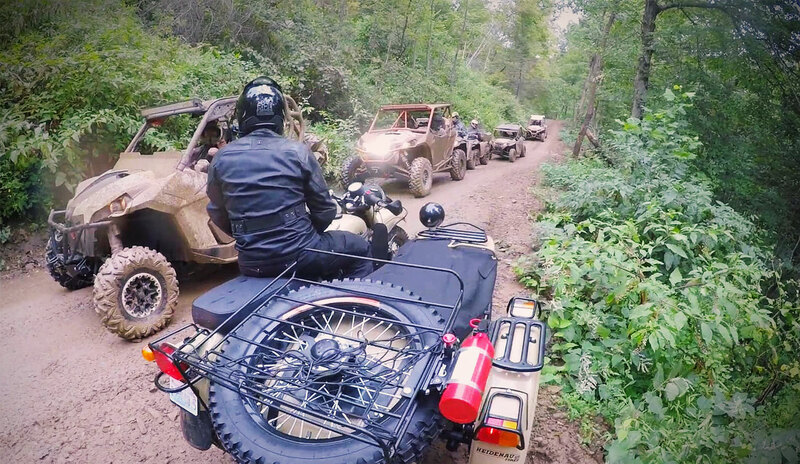 Many ATV riders and UTV pilots met us with a wave and big smiles. A few stopped to tell us we were crazy and some gave an enthusiastic thumbs-up. Most trails are meant for quads and high-powered 4WD machines, but the Urals did well to knife through thick layers of loose rock. These torquey sidecars chugged right along with relative agility. And, when it was time to jump back up on the asphalt, their stout chassis provided smooth and stable transportation after bouncing around for hours. If you’re wondering how the knobbies did on the pavement, the answer is: great. The Heidenau K37 and K67 tires aren’t soft; they have a compound that’s grabby enough in the dirt and hard enough to wear well on the street. The UTV and side-by-side folks were curious about our sidecar motorcycles. Both ‘bikes’ absorbed the bumps just fine. We kept a spirited pace in many areas (see the video), but we also rode with realistic expectations. 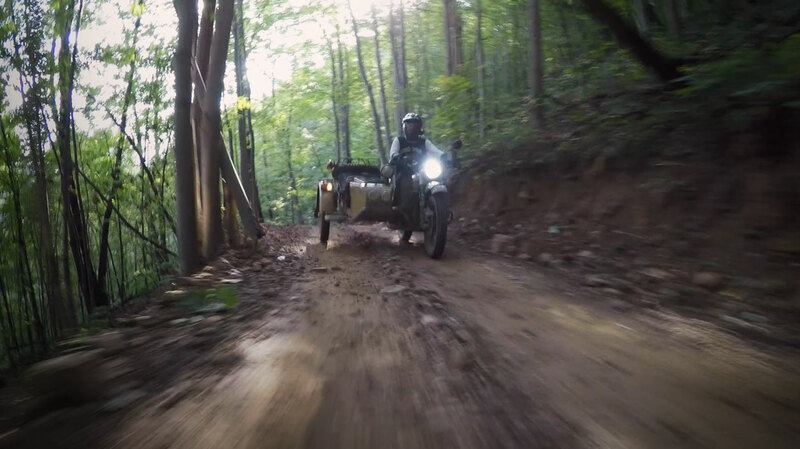 A Ural won’t handle like a Trophy Truck, but you can still give it heck. 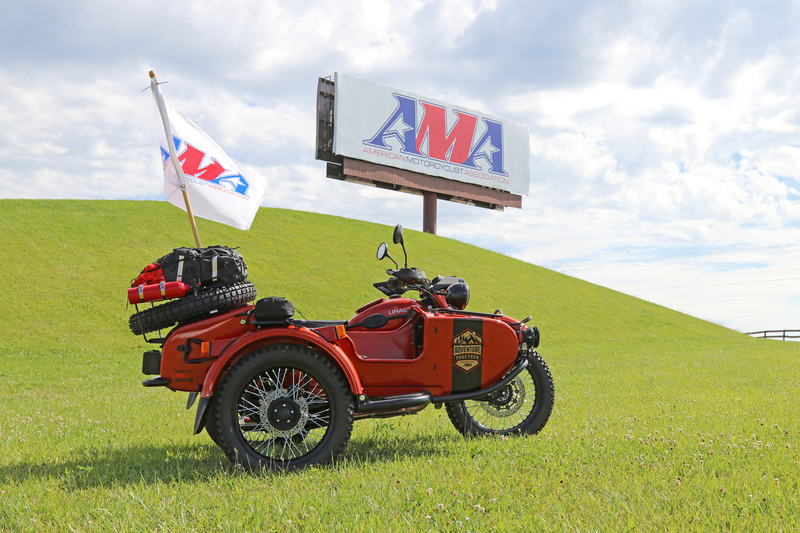 Keep in mind, it’s a sidecar made for on- and off-road travel; ride accordingly and you’ll have a great experience. In the end, if a person had to choose between a 1WD cT or a 2WD Gear Up model, we believe they’ll be happy with either. If the rider plans to ride mainly on the street with an occasional gravel road excursion, the cT would be just fine. If you live near sand, in snowy climates, or steep terrain, the Gear Up may be the better choice. But, as you can see, both sidecars are up for challenging conditions. Something to keep in mind, the cT is lighter and its sidecar is about 3.5 inches lower. It also has 18″ wheels (the Gear Up has 19″ wheels). These details give the cT slightly better street stability and lower center of gravity. Now, if you’re headed for technical, rugged routes, the 2WD will give you a welcome boost of confidence, for sure. 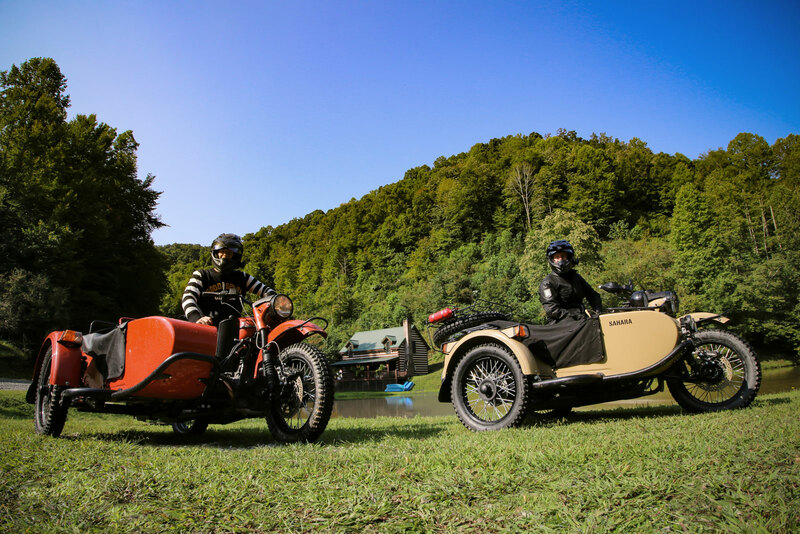 If you’re thinking about buying a Ural sidecar, watch our “How To Ride a Motorcycle Sidecar” video first. 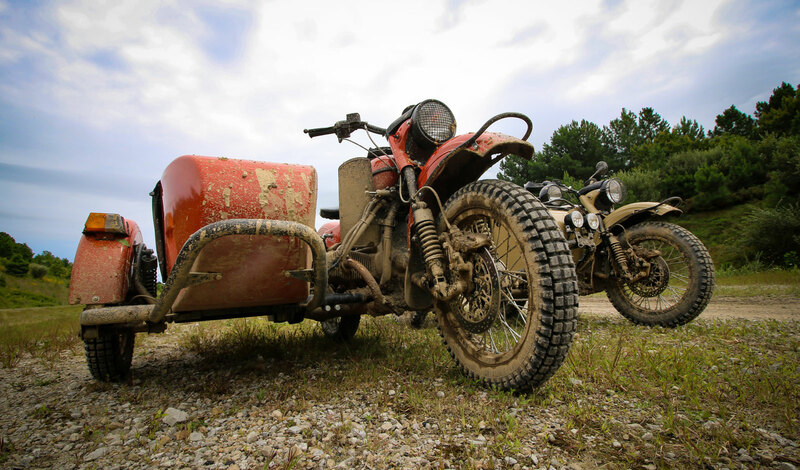 If you wanna know about the motorcycles, visit Ural’s website. 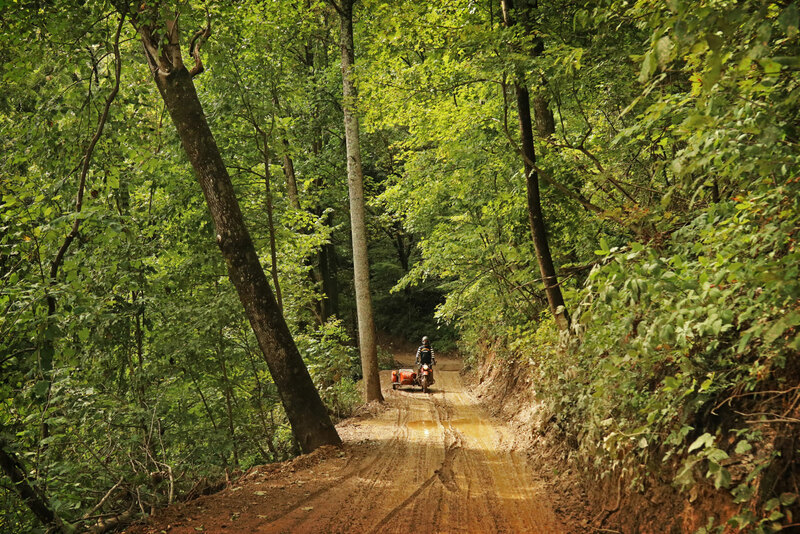 If you’re curious about the Hatfield McCoy trails rules and requirements, visit their website. 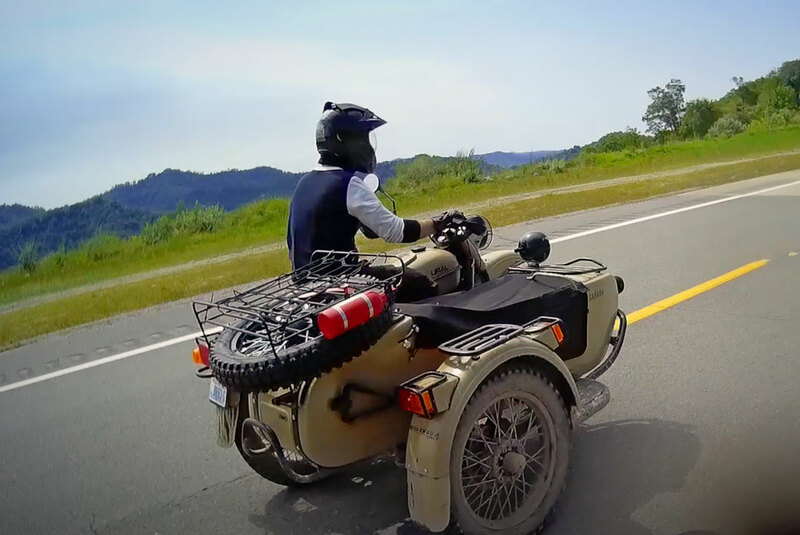 If you want to get out and explore the country via a sidecar motorcycle, go for it!! Learn more about the prize package and details here. Keep it tuned to Good Spark Garage to see where we go next. Thanks for riding along! I love your guys posts! I plan on owning a Ural one day. 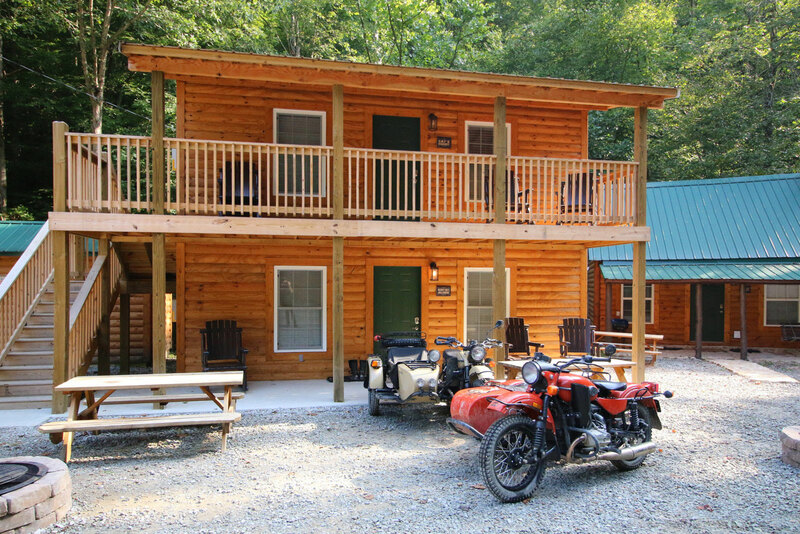 I really enjoyed your blog, at Ural, of the Hatfield McCoy Trails. Both the video and the article were great fun to read and observe. Your previous videos have been fantastically entertaining and so well produced. As a Gear Up owner, “suffering” from UDF, I tell relatives, friends,and acquaintances to watch your videos. They have made made it so much easier to explain why I enjoy my Ural. I am leaving Alaska for a trek this spring to Arizona, the U.P. of Michigan, and Yellowstone before returning to Alaska. Bet I go through more than a couple of Heidenau tires. Wish I could make videos as well as you. Good luck and have fun on your upcoming trip! 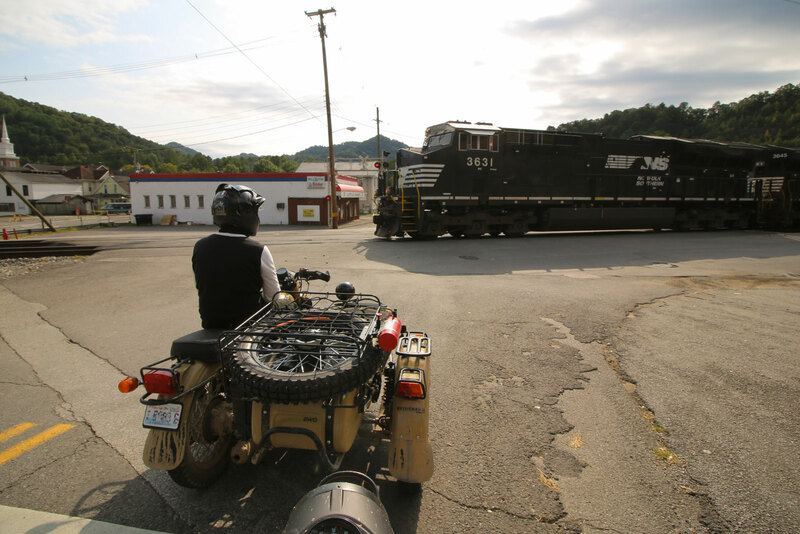 Watched the blog on the twin riding urals on the trail. I want to put K37s on my 2017 gear-up. I live in Elko, NV, where my son and i like to ride the gravel roads out here,we also like to ride BDR trails. Should i also put K37 on sidecar? can i leave stock tire on the front? We’d suggest running the k37s on all wheels. It’s wise to have it in the front for better steering/braking grip in the slippery loose stuff. You’ll want one on the sidecar for maximum traction on off-camber hill climbs, ruts or slimy conditions. When the pusher tire wears down, swap it with the less worn sidecar tire.